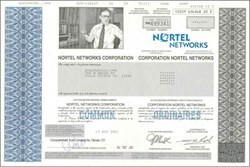 Beautifully engraved Certificate from the Nortel Networks Corporation. This historic document was printed by the Canadian Banknote Company and has an ornate block border around it with a vignette of a Network Technician. This item has the printed signatures of the company's officers. Nortel Networks is an industry leader and innovator focused on transforming how the world communicates and exchanges information. The company is supplying its service provider and enterprise customers with communications technology and infrastructure to enable value-added IP data, voice and multimedia services spanning Metro Networks, Wireless Networks and Optical Long Haul Networks. 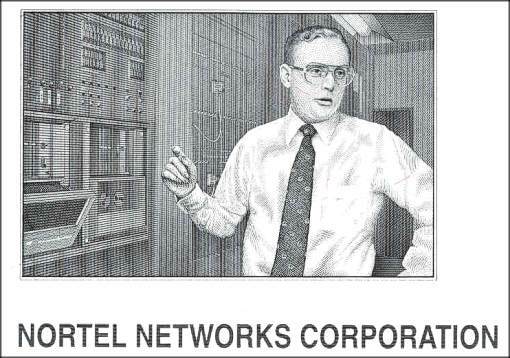 As a global company, Nortel Networks does business in more than 150 countries. In August of 2000, the company's stock traded over $85.